MEREDITH VIEIRA: You, you take some rather harsh look at some of our military endeavors, Chris. And, and some people are gonna to look at this, this documentary and say it's unpatriotic. You've heard that already with regard to your book. Matt and Al are right now in Afghanistan with the troops. VIEIRA: What would you say to them and their families who might not like what they hear in the documentary? CHRIS MOORE: Well, I think the larger point of the documentary is to question authority and question why they're there. I mean, but what I'd say is I'm a huge supporter of the troops and I think they're there and we think they're there. Howard served in World War II. It's not anything against the military. It's against when it's chosen to be used, how it's being used and that people in power should think very long and hard and the people should support that or not support that about when we put people in harm's way. And I'm sure every person there in Afghanistan is thinking about their family back here, thinking about the holidays, and I guarantee you all of them are thinking, "Why am I here? What am I doing here?" And I think it's the people's right to make sure that the government thinks that through before they send people. ZINN: You know, I think the most patriotic thing a person can do is to question the government when the government is not fulfilling its obligation. And you know, in the case of the troops, I believe the best way to support the troops is to bring them home. You're not supporting them when you're keeping them there and for not a good reason. You know, one of the things, one of the things we have in the documentary is we have Josh Brolin reading Mark Twain and Mark Twain is commenting on our invasion of the Philippines. [He] said, "Why are we killing these people half a world away and for what reason?" They say it's for democracy, for civilization. Same things that are said about Afghanistan and Iraq. 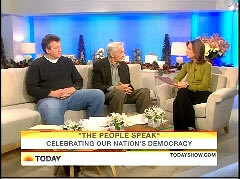 MEREDITH VIEIRA: And now to the power of democracy. An interesting new History Channel documentary uses celebrity readings and performances to highlight the ordinary Americans who changed our nation's history. Take a look. JASMINE GUY: If the land is free and the flag is mine, then how come I can't do like the white kids? ROSARIO DAWSON: He has taken from her all right and property, even to the wages she earns. DON CHEADLE: Power concedes nothing without a demand. It never did and it never will. MATT DAMON: Maybe a fella ain't got a soul of his own but only a piece of a big one. VIEIRA: Howard Zinn narrates The People Speak and is one of the project's executive producers along with Chris Moore. Good morning to you both. Howard, I would like to start with you. Very powerful documentary. It's based on your book, "A People's History of the United States," and you have said that you wanted to present history with a different point of view than what we learned in school, where you think a lot of history is sugar-coated. HOWARD ZINN: Yeah. I think a lot of history emphasizes too much the people on top, the presidents, the military heroes, and we, you know, I wanted to emphasize, yes, the working people, the dissidents, the antiwar protestors, and generally, the people who are left out of the traditional histories. I wanted to really encourage people to speak up. And so, we, we draw on historical examples in, in this documentary of people speaking up. VIEIRA: So, maybe people are gonna understand that we all have a voice. Chris, you've said a major theme in the documentary, I think that Howard just touched on this, is that democracy doesn't come from the top, it comes from the bottom. CHRIS MOORE: I think that, that we have to help our leaders figure out where to go, what to do, how they should have their companies behave or how the country should behave. And so the idea is to put it all in one place - these very dramatic and inspiring moments where people stood up for something and actually made a difference. VIEIRA: Well the documentary makes a very interesting point that the Declaration of Independence was a, was a statement of, you know, hope and, and positive democracy. And then the Constitution came along and sort of negated that. ZINN: You obviously saw our documentary. ZINN: No, and we have Matt, Matt Damon reads from the Declaration of Independence, which is very crucial to our documentary, because what it says is that governments are not supreme. Governments are artificial creations. They're set up in order to ensure life, liberty, pursuit of happiness, and when governments become destructive of that, it's the right of the people to oppose it. It's a fundamental principle of democracy. VIEIRA: You, you take some rather harsh look at some of our military endeavors, Chris. And, and some people are gonna to look at this, this documentary and say it's unpatriotic. You've heard that already with regard to your book. Matt and Al are right now in Afghanistan with the troops. MOORE: Well, I think the larger point of the documentary is to question authority and question why they're there. I mean, but what I'd say is I'm a huge supporter of the troops and I think they're there and we think they're there. Howard served in World War II.. It's not anything against the military. It's against when it's chosen to be used, how it's being used and that people in power should think very long and hard and the people should support that or not support that about when we put people in harm's way. And I'm sure every person there in Afghanistan is thinking about their family back here, thinking about the holidays, and I guarantee you all of them are thinking, "Why am I here? What am I doing here?" And I think it's the people's right to make sure that the government thinks that through before they send people. VIEIRA: Well, the point, I think, of the documentary is for people to think, think for themselves and to speak out. VIEIRA: Howard Zinn, appreciate you being here, Chris Moore as well. The People Speak premieres on Sunday night on the History Channel. We're gonna head back to Matt and Al in Afghanistan in just a moment.